Palm Tree Trimming in Encino | Your Way Tree Service Inc. The palm tree might be the quintessential symbol of southern California. For much of the country and really the world, seeing a palm tree means warm weather, cool nights and glamour. These trees are an organic symbol of the Los Angeles lifestyle. How many movies and TV shows have you seen where someone arrives in LA for the first time and one of the very first things they do is drive down a road lined by palm trees? These trees are a gorgeous, organic part of the landscape. However, sometimes they don’t do exactly what we want them to do. That’s where our palm tree trimming in Encino and the surrounding area comes in. In this blog, we’ll go over how we deal with palm trees as well as some other services. Many of us living in southern California didn’t start here. We came from somewhere else and moved here. Palm trees did the same thing. While the “California Fan Palm” is native to the area, other kinds of palm trees aren’t. They were brought here, too. So, they require special care. You may think that they’re just a desert tree, but the truth is they actually require far more water than most people think. We can help with this in addition to trimming. We can make sure that your tree receives enough water to stay healthy all year long. Most know the word “skimming” from crime movies or stories about theft: “he ‘skimmed’ off of the top.” With palm trees, skimming means that we take dead fronds as well as their remains off of the tree. We do this by shaving literally off of the tree itself. While this is a service we recommend performing in the spring, the important thing is that your palm trees get their skimming. What typically happens is that a palm tree accumulates dead fronds over the course of the winter. While we don’t exactly have record snowfall in southern California, it does get colder. Some of the fronds don’t get the same insulation as the others on the tree, and they die. By letting our pro palm tree skimmers remove those fronds; you’re helping your tree be healthier. Those dead or dying fronds on a palm tree aren’t good for the palm tree or your property. They can become a haven for mites and yellow jackets, as they love to build nests in those fronds. Most people don’t realize this, but these dead fronds can become a fire hazard as well since they’re incredibly dry. The last thing you need on your property is a large fire hazard that you’re unaware of. That’s particularly true in recent years, as it seems like the fires get worse and worse every day. By calling in our tree trimming pros, you can make sure that your property is as fireproof as possible. Trimming palm trees isn’t like trimming other trees. 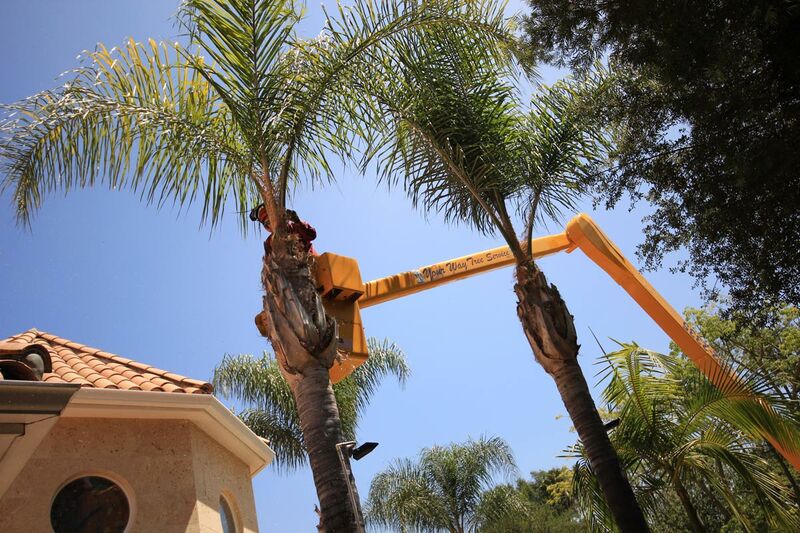 Many of our competitors know how to hack branches off of a dead tree, but don’t have the top of the line equipment to get rid of the dead fronds on a palm tree. Here at Your Way Tree Service, however, we’ve been doing this for two decades. In that time, we’ve probably trimmed thousands of palm trees. So, while every palm tree and situation is different, we can bring our experience to your property. We’ll look at your palm trees as well as your situation and then give you an estimate. It’s important to note that any estimate you get from us is exactly what you’ll have to pay. We’ve seen too many others in our industry tack on surprise fees at the end, or spring something on a homeowner once the palm trees are half skimmed. We refuse to do that. We don’t just want to work with you on this one tree trimming; we want to build lasting relationships with the people in our community. We live and work around here, too. It’s an honor to be a part of this community, and we treat each tree trimming job like we were trimming a tree on our own property. Of course, skimming with palm trees is just one of the many services we offer. We can also do straight out tree removal, should a tree be somewhere where you don’t want it to be. It’s not like we’re limited to palm trees, we can trim regular trees, too. You don’t have to be stumped by a stump in your hard – we can get those out of the way so that you can better enjoy your yard safely. For a full list of what we can offer, head to our site or give us a call at (818) 888-9248.